“The goal of protecting consumers by making it clear that investors, taxpayers, and other stakeholders must share in the costs of wildfire prevention and damage is one we are in total agreement with,” said TURN executive director Mark Toney. Any legislative solution to the California Wildfire Crisis must contain the following. No Bailouts.Ratepayers should not pay a penny for wildfire damages, whether caused by utility negligence or not. Shareholders should pay their fair share of wildfire mitigation, in addition to all damages due to negligence. 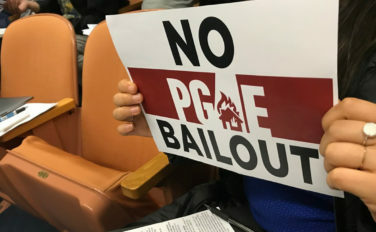 CPUC must exercise greater accountability from PG&E through stricter oversight. Ratepayers must be protected through a wildfire insurance fund that is funded through property insurance. Consideration of broader structural changes, including public ownership, of parts or all, of PG&E.